A Twitter conversation led NHL.com’s Joe Yerdon and I to sitting down for a podcast on the goalie market and how it affects the Sabres. We run through the pros and cons of the thin free agent crop while also touching on some more interesting trade options which could come to light. Who Can the Sabres Target as Linus Ullmark’s Partner? Three years removed from trading a first round pick for a player they hoped would cement their future at the position, the Buffalo Sabres goal crease remains in flux. Linus Ullmark is poised to step into a full-time NHL role for the first time but who will partner with him for at least the 2018-19 season is still a question. Despite holding control over his RFA rights, it seems increasingly doubtful that Robin Lehner will be back in Buffalo for another season. Ullmark’s progression has been steady to this point in his career and there’s no doubt he’s ready for this promotion. However, he’s never handled starter’s minutes at the NHL level. So it stands to reason that Jason Botterill will want to ease Ullmark into a starters role, though his 20 game foray in 2015-16 should provide some baseline for the workload he can handle. There is something working in Ullmark’s favor here and that is he is no stranger to heavy workloads. He saw the majority of minutes with Modo in the SHL and has been a horse for the Amerks for the past two seasons. He’s played 55 and 44 games over the last two years and he led the AHL in minutes (3201:55), shots faced (1678) and saves (1525) in 2016-17. What’s unknown is the number of games the Sabres hope to give Ullmark this season. Do they hope to get him in upwards of 50 games? Or is a 50/50 split a more manageable workload for a rookie goaltender playing behind a roster which is expected to see quite a bit of upheaval? The only scenario I think we can fully rule out is Ullmark playing as a true backup. Even if Lehner is brought back, I doubt Ullmark gets into fewer than 35 games with his partner getting the lion’s share. The Sabres want to see if Ullmark is indeed their goaltender of the future and they won’t be able to accurately evaluate that if he gets a backup’s share of the games. How Much Responsibility do the Sabres Goaltenders Bear for Lost Points? 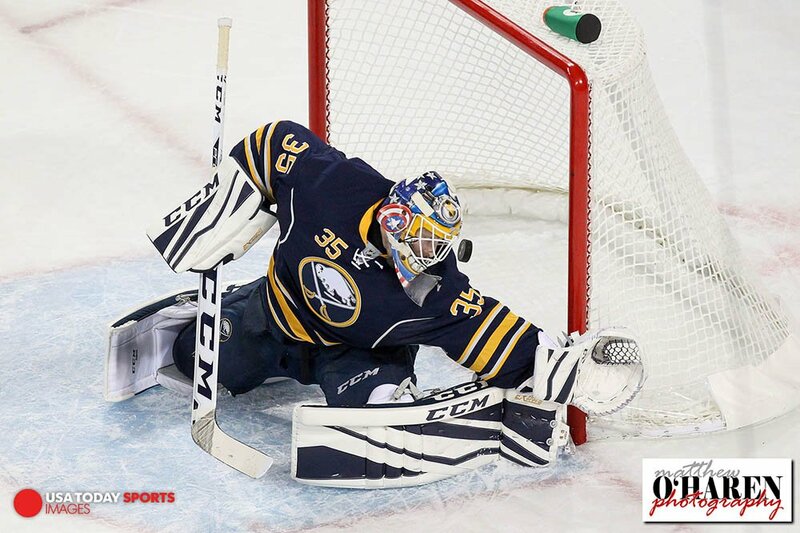 On the laundry list of issues the Buffalo Sabres are facing, goaltending ranks relatively low. A slow roster with some problematic contracts all while dropping from first to worst (technically 27th as of today) has far bigger issues to address than goaltender. Although it may rank low on the larger list of issues facing Jason Botterill and company, it is indeed a problem area that is in need of improvement moving forward. Improved goaltending wouldn’t be the silver bullet needed to get the Sabres into a playoff position. It wouldn’t even get them into the race at this point, which speaks to the myriad issues with the roster at the moment. But their goaltending has indeed cost them points in the standings, enough to, at the very least, pull them from the doldrums of the league basement and into a more respectable standing. For a club with nearly 50 years of history, the Sabres sometimes lack a laundry list of alumni at certain positions. Goaltender is one of these, where the Sabres have seen quite a bit of longevity and their fair share of star power compared to their league brethren. This longevity has bred quite a few hare-brained debates regarding starters at the position but also leaves the team with a smaller pool of alumni than other teams can claim when it comes to trivial things such as ranking goalie helmet designs. 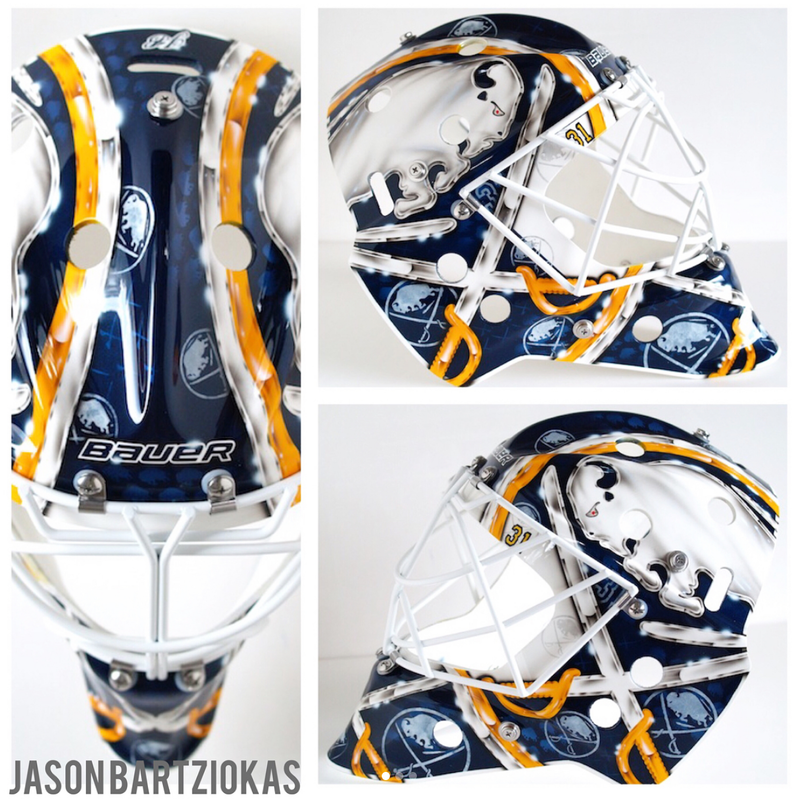 With the Sabres at the center of their fair share of negative articles, it seems like a good a time as any to share my favorite Sabres goal mask designs as a way to distract, even for a short while, from a season that’s as dreary as anyone can remember. I’ve put together what I feel are the ten best masks in Sabres history with a few honorable mentions filtered in when appropriate. Each ranking was based on a single mask a goalie wore as a Sabre (except when multiple masks were considered) and the overall paint job was considered. Bonus points for minute details common on modern masks didn’t factor in since that created the potential for excluding older masks. 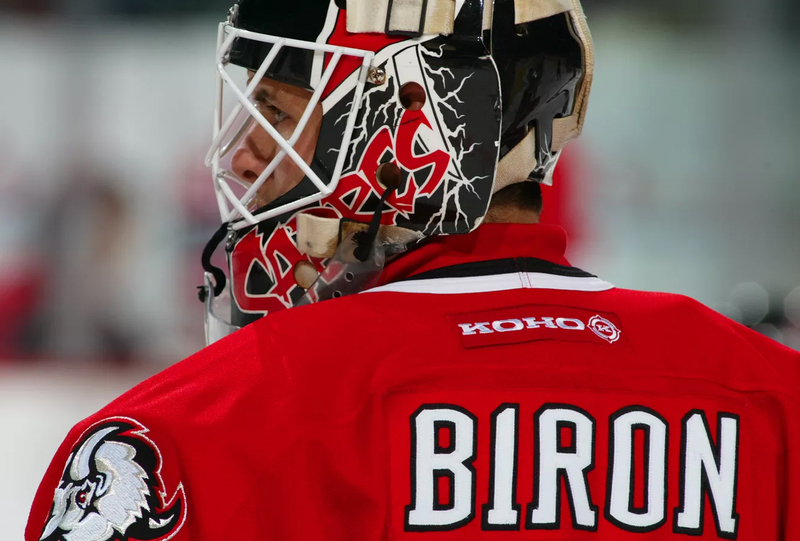 It’s been three games and there are plenty of questions about Buffalo’s goaltenders. So I reached out to Greg Balloch of In Goal Magazine to talk about Robin Lehner’s shootout struggles and more. Greg gives incredible insight to the strong and weak points of Lehner’s game, where he sees Lehner taking the Sabres and even offers up some thoughts on Ukko-Pekka Luukkonen. Greg also went deep into effective and ineffective goaltending statistics, providing a better way to look at goaltenders at the NHL level. The Sabres are back and with a new hockey season comes new hope, new expectations and, most importantly, new goalie equipment. Every goalie in the Sabres system has a new-ish look for the season and while this lineup certainly isn’t the most impressive collection of masks and gear the team has ever seen, there are still a few solid set ups throughout the pipeline. None is better than Robin Lehner’s phenomenal Brian’s OPT1K set. Known for unparalleled customization, Brian’s and Lehner cooked up a terrific blend of stock and custom team-logo graphics. I’m not always a fan of the fully custom team logo sets Brian’s creates, but the Sabre on each piece of Lehner’s set is understated enough that you have to look hard to find it. Chad Johnson is really the only other worthwhile set up to speak of. He is sporting a clean Ventus set that is a little less colorful than the Ventus gear Lehner wore last season. 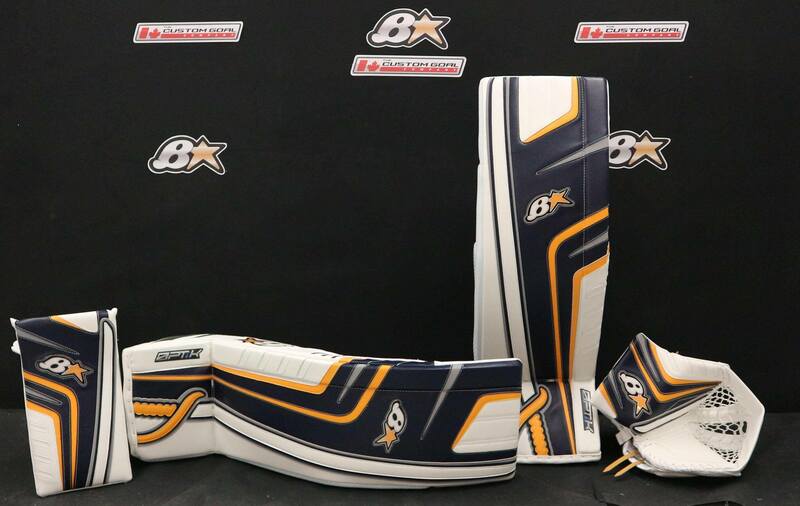 The Ventus graphics are attractive and work nicely with the Sabres colors.